Legendary singer/songwriter Joni Mitchell is widely considered folk royalty for her highly prolific, and widely acclaimed, decades-spanning career. It was during this time she was already starting to experiment with pop and rock genres. Throughout her career she has garnered several Grammys in various categories, including traditional pop, pop music and lifetime achievement. Her album Court and Spark (1974) signaled her foray into jazz and jazz fusion and was lauded by critics; it ended up becoming her most commercially successful project to date and was nominated for four Grammy Awards, of which Mitchell won for best instrumental arrangement accompanying vocalists. Other notable successful recordings include Blue (1971), The Hissing of Summer Lawns (1975), and the highly experimental Hejira (1976). In 1982 Mitchell married bassist and AFM Local 47 member Larry Klein, who worked on her album Wild Things Run Fast (1994). Klein soon became an established music producer and worked on a number of Mitchell’s albums throughout the late ’80s and early ’90s. While the couple worked on Turbulent Indigo, they eventually divorced in 1994. The following year Turbulent Indigo won a Grammy for best pop album. A Life Member of the American Federation of Musicians Local 47, she joined the union in 1974. In November 2018, in celebration of her 75th birthday, two concerts presented by the Music Center took place at the Dorothy Chandler Pavilion where musicians from throughout the nation performing songs spanning her entire life and career. Special guest performers included Emmylou Harris (Washington, D.C. Local 161-710); Kris Kristofferson (Nashville Local 257); Rufus Wainwright and Marvin Sewell (New York Local 802), Diana Krall (New York Local 802/Toronto Local 149), and David Hidalgo and Greg Leisz (Los Angeles Local 47). Following the concert, Mitchell was honored with the Music Center’s Excellence in the Performing Arts Award. 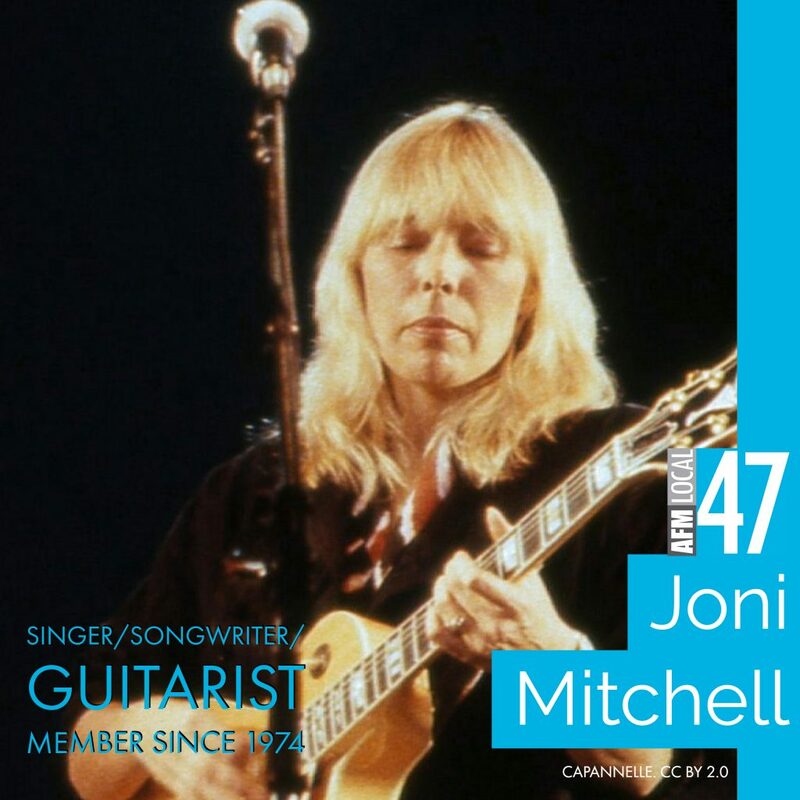 This entry was posted in All News, Features and tagged Joni Mitchell, women in music on March 7, 2019 by admin. I met her at Roger Kellaway’s house in thousand oaks, in 1971/72.